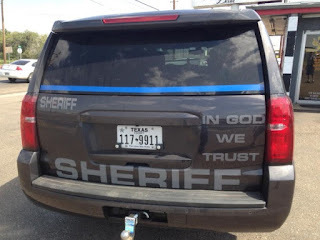 The Freedom From Religion Foundation recently sent a demand letter to Childress Police Chief Adrian Garcia calling for the removal of the motto from the vehicles, arguing that it is a violation of the separation of church and state. 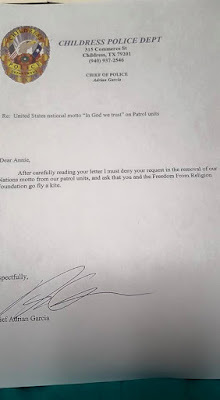 After carefully reading your letter I must deny your request in the removal of our Nations [sic] motto from our patrol units, and ask that you and the Freedom From Religion Foundation go fly a kite. Garcia posted the letter to the Childress PD Facebook page, and it has garnered over 74,000 “Likes” and 62,000 shares in less than 24 hours. Other police departments around the country have followed Garcia’s lead and shared pictures on the Childress PD page of their vehicles emblazoned with the prodigious motto. 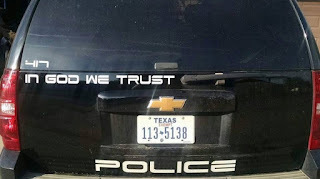 Federal courts have consistently found that the displaying of the nation’s motto does not violate the First Amendment’s establishment of religion clause.